This cleanser is utterly gorgeous. I bought it whilst trawling the internet for sensitive skin products that I could use after beauty shoots (my skin tends to get very sore) and it was an instant hit. I usually use Pai’s cleanser (excellent, see here) when my skin’s feeling fragile but it’s good to be able to write about a variety of brands and price-ranges, I think. Choice is a beautiful thing! 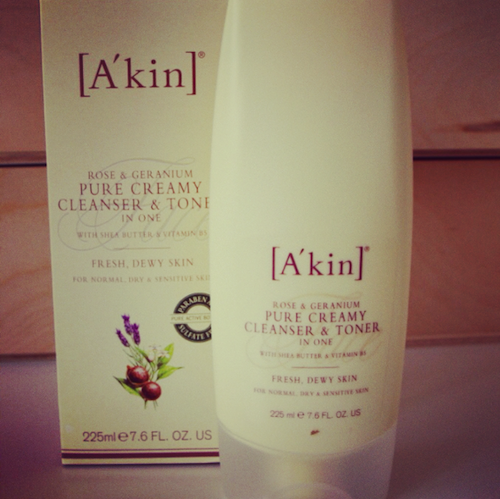 The A’kin Pure Creamy Cleanser & Toner in One jumped out at me because it claimed to be for normal, dry and sensitive skin yet the “finish” was “fresh, dewy skin”. So a cleanser, in effect, that’s comfortable on skin that’s perhaps a little tight or dry but that doesn’t leave any kind of waxy film or greasy residue. And this cleanser does exactly what it says on the bottle: it’s sumptuously creamy and a joy to use yet it rinses completely clean. I think that pretty much any skin type would get on with this – I can get quite oily in the T-Zone but it seems to leave my skin very well balanced. I’m not overly familiar with A’kin as a brand but I shall most definitely be popping a few more bits on my list after this success – let me know if you have any suggestions!